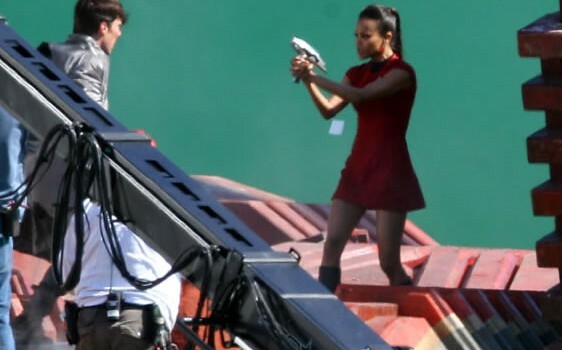 First Set Photos From “Star Trek 2.” | The Cineaste's Lament. ← Four-Minute “John Carter” Sneak Peek Debuts. Once again, via HeyUGuys, here’s the first batch of set photos from director J.J. Abrams’ sequel to his reboot of the Star Trek franchise. The film reunites the original cast: Chris Pine (Kirk), Zachary Quinto (Spock), Zoe Saldana (Uhura), Simon Pegg (Scotty), John Cho (Sulu) and Anton Yelchin (Chekhov). Alice Eve (“She’s Out of My League) signs on for the sequel. Ditto for Benedict Cumberbatch, who’s playing an unnamed villain. 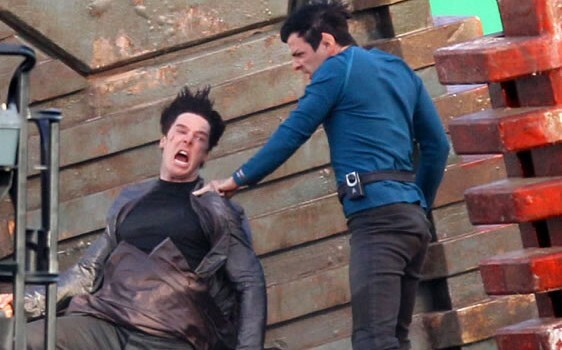 The first photos show Quinto and Cumberbatch duking it out, with Saldana joining in the fun. This entry was posted in action, Film News, Sci-Fi, Sequel-Itis, Summer Blockbusters and tagged Alice Eve, Benedict Cumberbatch, J.J. Abrams, Simon Pegg, Star Trek, Zachary Quinto Zoe Saldana. Bookmark the permalink.